The energy production industry is increasingly replacing fossil fuels with renewable fuels. Mixed fuel combustion creates ash which cannot be used as fertiliser because of its composition. Energy producers are looking for new ways to re-use ash. 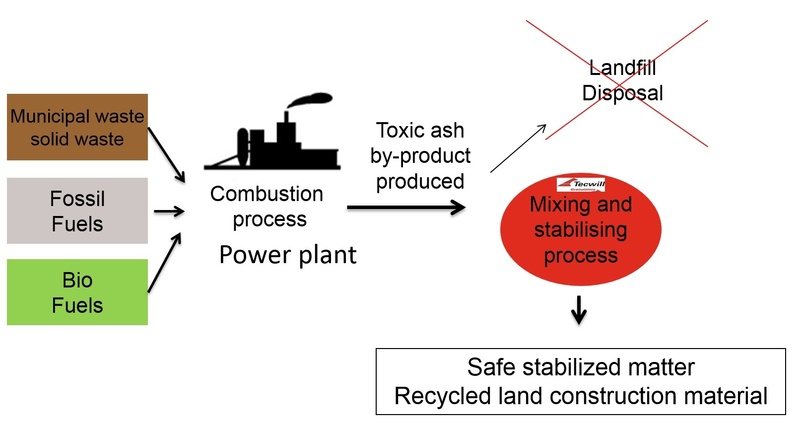 The ash from mixed fuel combustion can be used in ground construction work such as roadways, recreational areas and general landscaping in place of depleting natural resources. Because the ash by-product is recycled back into use, environmentally taxing landfill disposal is lessened. Environmental and recycling companies are presented with a new opportunity to offer ash management services to energy providers and to sell the stabilised ash material to the construction industry. The ash created when municipal waste is burned is classified as dangerous waste which has to be treated to make it safe before it is finally dumped or used elsewhere. The need for waste combustion services and, as a result, also ash management services, will increase in the near future. Tecwill has developed the Cobra and Arcamix model for stabilising different types of mass, ash and problem waste. Ash is mixed with suitable additives and binding agents, and possibly with other industrial by-products, to create a safe material. COBRA represents a new way of thinking in mixing and stabilising. The mixing station is constructed completely at the factory and delivered ready to use. The station can easily be moved to a new location when production or market circumstances change. Although the Cobra and Arcamix is a mobile mixing station, it offers the same capabilities as a fixed station thanks to its special patented design. Cobra and Arcamix is a compact solution that combines quick and easy installation, large production capacity and top-quality mixing.